Mustafa Kaya: "where Are We İn Foreign Policy'"
›Mustafa Kaya: "Where are we in foreign policy?" Milli Gazete columnist Mustafa Kaya writes on Turkey's foreign policy. Here is the full article. Today, there are elections in Israel. 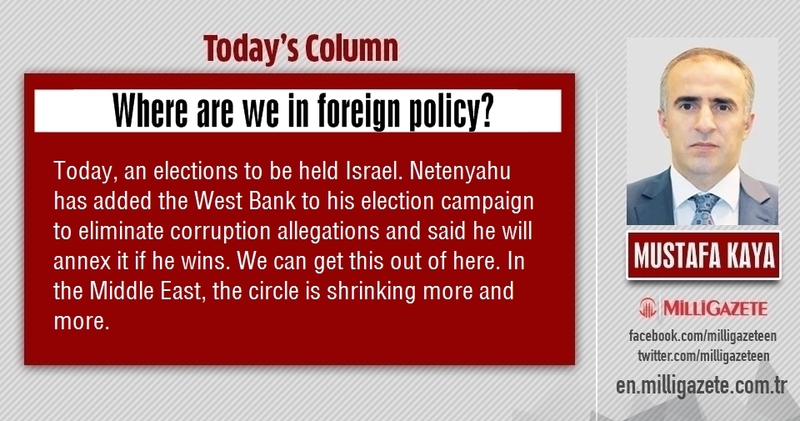 Netanyahu has added the West Bank to his election campaign to eliminate corruption allegations and said he will annex it if he wins. We can get this out of here. In the Middle East the circle is shrinking more and more. Netanyahu’s statement to the West Bank became peppery while Trump’s move to Jerusalem and his statements that the Golan heights belonged to Israel remained warm. We are faced with a multi-dimensional game. We have reached the final stages of the process that started with the Great Middle East Project (BOP). Turkey, unfortunately, fell into the trap of the start of this process was the front foot. If we refresh our minds, BOP was first presented with fancy sentences. The publics of the Middle East was promised democracy. The propagandas that the dictatorships will come to an end and everyone will have western standarts in terms of rights and freedoms were made. Some believed that. The Arab Spring was built upon this scenario. Along with this process, some perceptions were made that everything will be like a bed of roses. However, at the point we reached only thing we got is a “huge nothing”. Moreover, Israel began to experience the most comfortable period of its history. In addition, the separations between Islamic countries were planned specifically. Saudi Arabia and the UAE on one side while trying to pull different head, Sisi on the other side who came with the coup, took steps to ease Israel’s hand in the Eastern Mediterranean. And Turkey began to live so security concerns that as saying S-400’s and F-35’s and patriots, it began to worry that how can i protect myself. We always said. Let’s repeat it again. The powers want to Pakistanize the Turkey via Syria here in were partically successful. They wanted to make Turkey to live what Pakistan lived in the border of Afghanistan, via Syria. The BOP was a project of not leaving a country with a regular army around Israel. Now this is clearly understood by everyone. NOw, let’s ask this question; Was HAMAS presenting a more compact image when it was in Syria yesterday, or is it now acting more effectively in Qatar as a refuge? Let’s continue with questions like this. Are the ongoing problems in our border today easier to manage before the US and Russia settled in the region, or are they now overwhelming? Let’s add a question through Libya. As you know, Israel and the West supported Haftar , is preparing an attack to Misrata and Tripoli. Was Turkey’s hand stronger when Libya was monolithic or is it more effective now? Moreover, let’s include Yemen in this chain. What position do you think of our position in Yemen where our footprints still exist? I know, the answer to each question is very clear. Turkey has reached to these days with its own wrong foreign policy that will compress itself 784 thousand square km area. Now, it’s looking for ways to get out of this jam. The “Zero Problem With Neighbors” policy became “Valuable Loneliness” but the statement that describes the point we arrived at couldn’t be found yet. Almost all of our work in diplomacy in Syria via the interview traffic with America and Russia is getting. The territorital integrity of Syria is stil on paper but our inner voice is giving the message that never mind Syria, keep yourself safe and secure. Our biggest mistake when we came to this situation is that we have often ignored the experience of foreign policy that has been formed so far. Now, we’re trying to find an exit, out of here. What do you say, do you think we can siege with this understanding?